When you travel with as many expensive toiletries as we do, you learn – rather quickly – which packing strategies work and which leave you with a toiletry travel kit coated in night cream. Here are our roadtested methods for arriving at your destination with your products – and your beauty regimen – fully in tact. First and foremost, choose your toiletry bag wisely. We designed our Travel Beauty Travel Bag to be slightly padded, zipper-enclosed and plastic-lined. The padding protects products from breakage, but if the unfortunate happens, the plastic lining and zipper stops it from getting unfortunate all over your vacation wardrobe! More and more beauty products come in eco-friendly glass bottles every day. And though they be beautiful on our vanity, they are perilous in our carry-ons. Enter the smaller size dust bags you’ve likely amassed…you know, the ones that come with large jewelry pieces (hello, Alexis Bittar bangle) and small leather goods. These are your beauty products’ best friends. Put each glass product in its own bag (the thicker, the better) to protect them from banging against each other and then breaking. What spills easily and what does not? For example, there’s an oil we love, but it seeps out of its bottle very easily. We learned (the messy way) that this particular product has to stay home. (We are not fans of transferring containers, especially with oils. Too much gets lost in transportation!) Also, pump bottles – the types you have to press down to lock – are all-around bad travel buddies. The pump almost always opens, and then the darn thing is pumping product out the entire time you’re in transit, unbeknownst to you! As much as possible, go with tubes that have tightly-closing flip tops. We also love powder formulas for travel, like Juvena Pure Lifting Peeling Powder. The less liquids to worry about, the better. Most of the products we really love do many different things…and do them all well. A quality multi-purpose oil, like Huile 27 can be used from scalp to soles, and works fabulously wherever you apply it. When thinking of which products multi-task well, don’t forget about those that are unisex! Ursa Major Essential Face Wipes are traditionally a men’s product. But these wipes are so cleansing and refreshing, we love them just as much as our husbands do! Then there’s Vine Minus Ion Water, which is so high tech and multi-talented it could probably fly the plane if need be. It is a great refresher/primer for hair and face, it moisturizes and has antibacterial properties. You can even brush your teeth with it! Not only did we get to chat with the lovely ladies behind Glitter Guide, but Taylor & Caitlin also took the time to shop Travel Beauty! They did a fantastic job curating a Glitter Guide Travel Beauty Travel Kit. What’s inside? 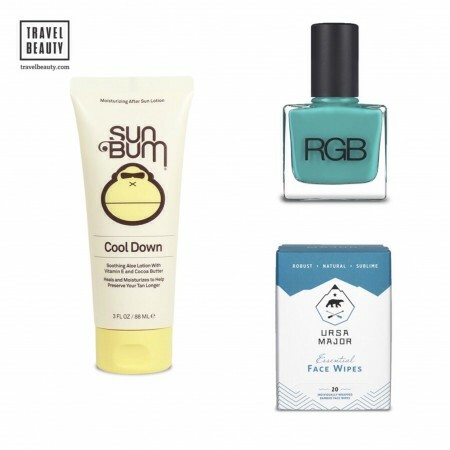 Here are their top product picks to pack and summer beauty travel tips for a beauty-full beach vacation. Keep reading for our exclusive Q & A with these inspiring gals. TB: What is your favorite part of what you do? How did you become interested in beauty? GG: Inspiring others and coming up with unique ideas to share with our readers. Beauty has always been an interest for as long as we can remember and now that it’s part of our job it’s even more fun! TB: What are your must-have travel beauty products that always make the cut into your dopp kit while traveling during the summer months? GG: Good shampoo and conditioner (hotel products always dry out my hair), sunscreen, hair oil to use post-sun, a lightweight moisturizer and sunless tanner. TB: What are you most concerned about, beauty-wise, when you travel during the summer months? GG: Having our tried and true products with us that we know work! Also making sure to have sunscreen and moisturizer (for post-sun burns) during the summer is key. TB: What is your fastest, fail-safe, look refreshed tip when traveling? GG: When traveling long distances or flying we tend to go for the ‘no fuss’ look — i.e. simple hair and makeup so there is less of a chance for things to go astray. We keep our hair in a pony (or wear a hat), simple tinted moisturizer, mascara and lip balm. When flying we always keep lip balm and both hand and face lotion in our carry-on to combat dry airplane air. TB: Can you walk us through the process of how you created your very own Travel Beauty Travel Kit? GG: Well, we’ll just say it was hard to pick just a few items from your selection!! We thought of the products that we’d hate to leave home without, but typically wouldn’t have in a travel size. Create your very own travel kit now. Perhaps you can’t make it to Majorca this year and are considering a domestic locale for a beach getaway. Miami may seem an obvious choice, but we suggest staying north of Florida in the picturesque Outer Banks, NC. It is the perfect place to take a stateside beach trip – from a fun girls’ getaway to a wholesome family beach vacation. With over 100 miles of gorgeous shoreline to choose from, selecting your perfect destination within the Outer Banks won’t be easy. It is all so beautiful! We took an extended family vacation (we’re talking three generations) to Avon, NC. We chose Avon specifically because the beaches have a rustic beauty that felt closer to nature than other parts of the Outer Banks. 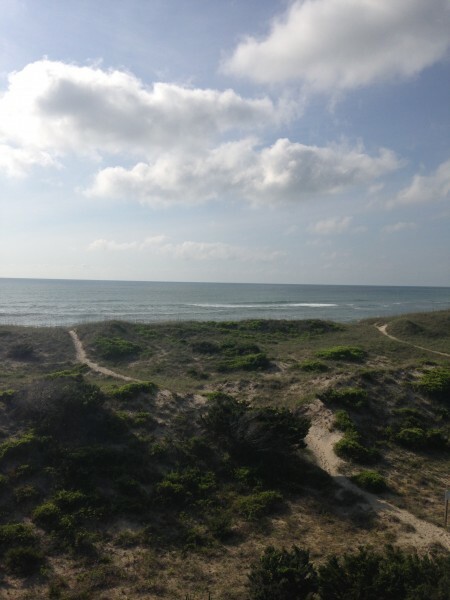 Indeed, looking out from the deck of our house to the dunes and beach below, my kids were jazzed to spot lizards, bunnies and crabs scurrying among the brush and bright wildflowers. On a more practical level, Avon had necessary conveniences right in “town” (hello, huge Food Lion supermarket!) that are downright lifesavers with 5 kids to keep fed and entertained. Basically every house in Avon is available for rent, so while the best homes book up quickly during the summer season, if you reserve early enough you should be able to find your perfect house from among the inventory. We rented our house through Surf or Sound Realty. When you select your rental, be sure to get a house that gives access to one of the pool clubs in the area. Many houses don’t have their own pools (but DO have their own hot tub), but include access to one of these pool clubs in the price of the rental. Our house came with a gold membership to Koru Village. Club Koru has a nice-sized and well-appointed pool (complete with tiki bar – BONUS), gym, restaurant that you can order from poolside and a spa! They also host events like fam-friendly luaus. All in all a really great rental perk! I remember being thoroughly freaked out when I learned about the “lost” Roanoke Colony in elementary school: A settlement of 116 men, women and children who disappeared without a trace. Roanoke Island, where Sir Walter Raleigh founded his ill-fated colony, is in the Outer Banks – and you can visit it! The entire Outer Banks area is not only beachy and beautiful, but also full of such historically significant places…more than I could possibly list here. But know, if you’d like to do a bit more that lay on the beach all vacation long (not that there’s anything wrong with that! ), the Outer Banks has so much cool stuff to offer. If you’re vacationing with kids, be sure to get a permit for a beach bonfire. Your realty agency can provide one. Our kids had such a blast making smores in the moonlight. Bring flashlights, too, so you don’t miss the march of the ghost crabs! Every night these guys come crawling out of the ocean towards the dunes, and your kids will love spotting them with flashlights. If you’d like to burn some calories while sightseeing, I highly recommend visiting the Cape Hatteras Lighthouse in Buxton. 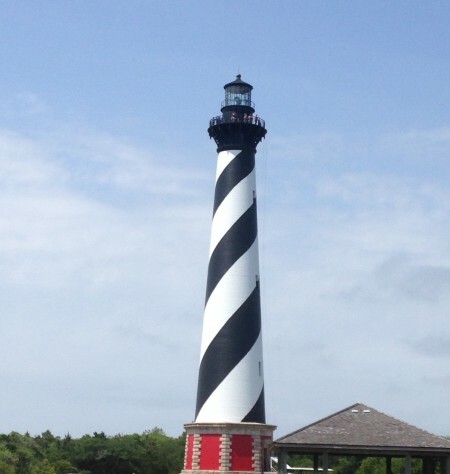 It was built in 1803 and is the tallest lighthouse in North America. Historical significance aside, best believe your beach body will thank you for making the almost 300 step climb to the top of the tower. Yowza…talk about buns of steel! You can pack back on all the calories you burned at the lighthouse with a family-friendly lunch at Buxton Munch Co., just down the road from Cape Hatteras. With its psychedelic, kitch-ed out decor and uber-casual vibe, this is the spot to eat with kids. There are piles of books on hand for the kids to read and tchotchkes hanging on every inch of wall space, so the whole family will stay entertained throughout the meal. The super-fresh fish tacos are the specialty here, and definitely a must-order, but their homemade tortilla chips are INSANE: Something between a traditional tortilla chip and the dried noodles you get in little bags with Chinese takeout. May sound odd, but trust me on this one…we all were fighting over every chip in the basket! Such flaky, salty, fried goodness could only come from the south. Though this was a family vacation, the hubby and I did sneak in one romantic dinner while in the Outer Banks. We heard from numerous sources that Cafe Pamlico at The Inn on Pamlico Sound was the spot in OBX for a romantic dinner. “Casual fine dining” may sound like an oxymoron, but this place gives life to the phrase. You can get dressed up or wear flip flops – either is completely appropriate. From the specialty gimlet to the crème brulee, everything we ordered was spot on. The menu changes frequently, but if you see mahi-mahi, make sure to order it…it was cooked to perfection! Cafe Pamlico’s most delectable offering, though, is its location. Situated right on the edge of the Pamlico Sound, we got to enjoy our dinner while watching the summer sun set over the water. It was the perfect (and peaceful) night out we needed. Even a simple overnight trip can turn disastrous if you suddenly discover you’ve forgotten to pack one of your beauty essentials. We are here to save you from ever suffering this unfortunate fate! 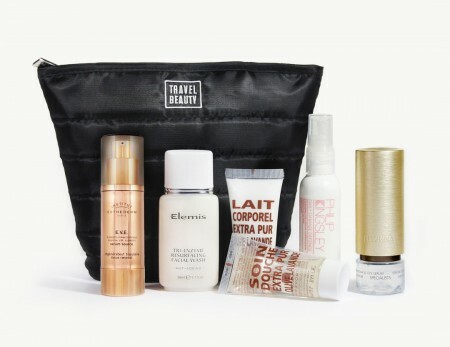 Travel Beauty has curated the ultimate collection of overnight beauty essentials in one convenient travel kit. Use this product guide as your packing list and you’re guaranteed to have a gorgeous getaway every time. Hitting the beach? Be sure to check out our beach bag beauty essential guide specifically for the sand and sun! Starting your day off with a sub-optimal shower can dampen anyone’s spirits, so a fragrant shower gel and body cream duo is a definite overnight beauty essential. We love Compagnie De Provence travel size shower gels and body milks. They come in a variety of scents, but you can never go wrong with Olive and Lavender Shower Gel and Incense Lavender Body Cream. The petite size makes these products perfect for a quick overnight trip. Sometimes an unfamiliar (and/or uncomfortable) bed can lead to us suffering through a night of broken sleep. But you’d never know it by looking at our faces! How do we keep our skin looking fresh no matter what? By packing our favorite essential face products. We keep skin clean with travel size Elemis Tri-Enzyme Resurfacing Facial Wash and follow that with Institut Esthederm E.V.E. Serum Source and Juvena Specialist Skin Nova SC Eye Serum. No overnight travel beauty kit is complete without these. This product trifecta will keep skin smooth and bright, even after a rough or restless night. You may choose to skip the shampoo on your overnight trip, but your hairstyle will nonetheless need refreshing at some point. Philip Kingsley Daily Damage Defence is an overnight beauty essential for hair you’ll always find in our travel kit. It protects, conditions, tames, smoothes and adds shine…with just a few sprays. We especially love Daily Damage Defence to protect our hair from those high heat hotel hair dryers. We’ve kept this overnight essentials travel kit intentionally pared down. Think you need to round your own bag out with a few more products? Shop Travel Beauty’s entire collection of luxury beauty and grooming products now. Copyright © 2019 TravelBeauty.com LLC. All rights reserved. We love it when people talk about us. 15% Off Your Order With Code "Fall15"